The Alpha Jet is a light attack jet and advanced jet trainer jointly manufactured by France’s Dassault Aviation and Germany’s Dornier Flugzeugwerke from a collaboration initiated in 1967. Under the terms of this agreement, each country agreed to purchase and assemble 200 aircraft. A total of 480 Alpha Jets would see production with deliveries starting in 1978 and would be adopted by various other countries. Due to different avionics fit, French and German Alpha Jets were visually distinct, with French planes (designated E for Ecole or school) featuring a rounded-off nose and German ones (Designated A for Appui Tactique or tactical strike) featuring a sharp, pointed nose. Germany would fly the Alpha Jet in the ground attack role. The Alpha Jet A specifications were noticeably different from France’s Alpha Jet E with many components provided by German companies. In addition to the ground attack role, the Luftwaffe would also fly the Alpha Jet in ECM and reconnaissance roles. The Alpha Jet was purposely designed to be simple (eg. it can be turned around in 10 minutes with minimal ground equipment) and easily exportable to other countries. It can carry up to 5,000lbs of munitions, which includes an external belly-mounted gun pod. In 1992, the Luftwaffe began to phase out their Alpha Jets with the last leaving the service in 1999. 16 were purchased by the Canadian company Top Aces (formerly Discovery Air Defence Services) in the 2000s and flown to provide ‘Red Air’ threat replication, ie. to fly as the ‘bad guys’ for adversary training. Some of these would retain the original Luftwaffe camouflage but others would be repainted in a unique white, gray and medium blue scheme. 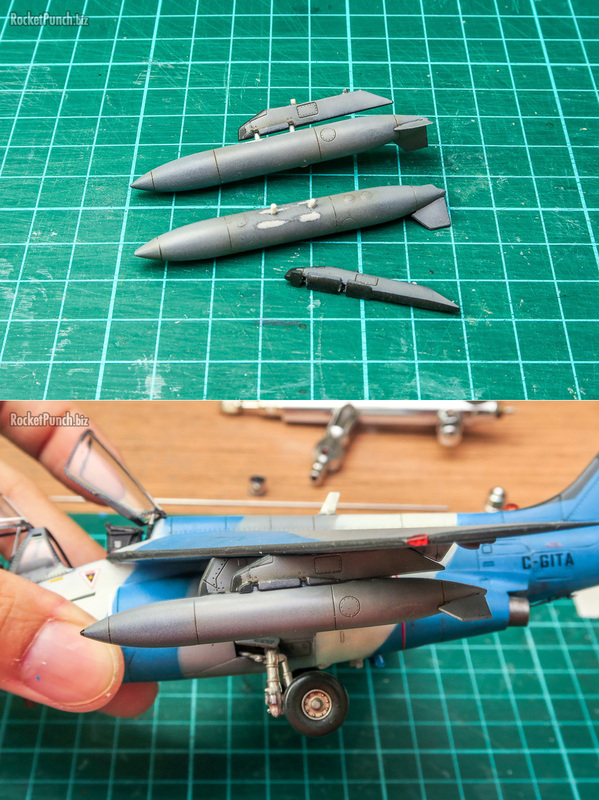 This build depicts a Top Aces Alpha Jet A. Before the release of this kit, your only option for a 48 scale Alpha Jet was by Esci from 1980 (which Heller reboxed) and a PJ Productions resin kit. So this was a welcome modern release in 2013 by Kinetic. Befitting its modern sensibilities, the kit is designed to be built into either the A or E variant of the Alpha Jet. The kit is broken down into 170 or so parts with separate inserts, antenna and noses for the various variants. It’s molded in light gray and comes in 3 styrene sprues, 1 sprue of clear parts and a small fret of photoetch parts. Details are good although the panel lines are somewhat heavy-handed though consistent. The parts also feel ‘thick’ and lack the finesse of stuff from Tamigawa. The clear parts are quite nice with minor distortion. All in all, it’s quite an improvement compared to my experience with their original F-16 releases. Interestingly, there are parts to build a Belgian B variant but no marking options for it. It’s definitely not as bad as their F-16 kit (which I threw in the towel after just trying to assemble the cockpit) but I pretty much had to dryfit, sand, trim and adjust almost every part. There were no sink marks and a minimum of ejector pin marks but most parts have some flash which required sanding off. At least the plastic was easy to sand and work with. The instructions are unclear in the direction of how some parts should fit. There are also wrong part call outs. Notably, I found out too late that for the air brakes to close, I needed only to install parts A6/7 instead of C14/15. I ended working quite a bit to get the air brakes to fit in place. All the gear doors required work as they are designed to be left open. I didn’t quite get the nose gear doors to fit closed properly. The main gear doors fit better but the starboard door is too short on one side. Some trim and adjustment was needed for every gear door part for them to fit. The cowling is short molded on one side. The intake halves fit well but they are narrow so there’s no real easy way to get rid of the joint line running length-wise down the engine trunking. The anhedral of the wings look good but they fit with some play into the sockets on the fuselage. I ended up making sure the fit of the leading edges of the wingroot were good and settled with fixing the trailing edges. Some of the panels unique to the A variant didn’t fit well and required a fair bit of trimming and brute force. The tailfin doesn’t fit flush to the base of the tail and required filling. Not my preferred method but the main landing gear needs to be installed before the fuselage was closed up. At least they are quite chunky and stayed in place throughout the build. I went with building each half completely with the correct nose and inserts before joining both halves together. Had I followed the instructions, I think I’d have more fitting problems. Major trimming and adjustments were required for the exhaust housings and for the speed brakes to fit closed. This latter bit could have been avoided if Kinetic had called out the correct parts for the closed position. I should have tested the fit between the pylon, sway braces and fuel tank before the finishing stage. I don’t think I ended with the correct fit and I find that the fuel tanks hang off the pylons wrongly. Like I said, ‘some basic modeling skills required’. However, while time consuming, not once did I really become frustrated and wanted to throw the kit against a wall. In the end I consider this kit to be a ‘good’ challenge. YMMV of course. Replacing the photoetch restraints with ones made of masking tape. Replacing the HUD projector and glass plates with thinner ones from a battery blister pack. Adding cabling to the back of the rear instrument panel. Adding cabling to the rear bulkhead of the rear cockpit. Adding details on the canopies including rear view mirrors and handles. Adding hydraulic lines on the landing gear. This kit will be part of my Aggressor collection so naturally, I’ll be going with the Top Aces scheme. Looking at photos online, these aircraft look very clean with only minor weathering. Translated to the model kit, I think this clean finish will look quite flat so I decided to take a bit of artistic license. I went ahead with adding a marble coat under the main colors to break up the monotony of the finish. I tried to make this marble coat lighter by using a medium and dark gray instead of the usual white. Then it was a matter of painting white, masking, blue, more masking and then the gray. Based on references, the demarcations are kept tighter than usual. I don’t have the exact shade of blue on hand but I think the end result compares well to the photos online which were all taken under different lighting conditions. One major thing Kinetic missed out are that the leading edges of the tailfin, wings, stabilizers and pylons are black. These are quite prominent in photos so were masked and sprayed. I’m not sure why this detail was missed although they didn’t miss the black for the splitter plates and intake lips. Kinetic also missed a small extension of black on the top side of the intake lips. The few decals went on very easily and reacted nicely to Mark Softer. However, some of the markings are slightly oversized compared to references. Weathering was also kept at a minimum based on what I’ve seen in references. With that done, I added the final parts and painting the details like the wingtip lights, antennas, pitot tubes, pylons and fuel tanks. Every one of these things required some sort of trimming and adjustments before they fit so it took a while. Again, I had to check references as the instructions had missing part numbers or the wrong info. In the end, I couldn’t couldn’t leave the fuel tanks alone. Checking references, it turns out the tanks attach directly to the pylons without the use of sway braces. So I pulled the braces off and inserted stretched sprue into the sockets in the tanks to create pins. These pins are then inserted into the sockets in the pylons. I think they look a lot better now. All in all, not the smoothest of builds but I had a bit of fun with this one. It just took longer than expected. Kinetic has definitely improved from their earlier releases (I finished this one after all) but they are still a ways from the likes of Tamigawa. This is definitely one of my ‘look from 2 feet away’ kits. Nonetheless, I’m glad to add this unique and IMO handsome aircraft to my finished column.